Taking steps to enhance environmental responsibility in the planting and maintenance of campus landscapes. 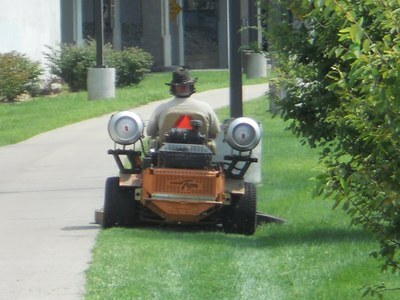 Campus Grounds maintenance is the responsibility of Physical Plant, though some properties associated with UofL are maintained by contractors. The Sustainability Council works with the Grounds crew to explore ways to protect campus trees; to minimize the waste and excessive use of water, fertilizers, pesticides, salt and fossil fuels; and to find effective options for lower-maintenance and native species plantings. UofL is serious about protecting our trees! Check out the self-guided (or virtual) Belknap Tree Tour. Download the Tree Tour pamphlet. Although we’re located in an urban area, our 309-acre park-like Belknap campus has over 2500 trees representing over 130 species, many of which are native to our bioregion (see UofL tree map). UofL researchers and students have helped catalog over 1,740 individual trees just on the core of Belknap campus that represent a total of 117 species from 54 genera. Explore our Tree Inventory to learn even more about our diverse canopy. We invite you to take a self-guided 1.75mile walking tour of some of the interesting and historical trees on Belknap campus. You can access the interactive map with your smartphone, tablet or any computer, download the Tree Tour pamphlet, or pick up a print version during business hours at the North Information Center, 1999 S. First Street (call 502-852-6565 for information). Our trees bring natural beauty to our campus. They are an archive of our past and part of the circle of life we share with nature. They also play an essential role in UofL’s initiatives to create a sustainable campus environment. A mature leafy tree produces as much oxygen in a season as 10 people inhale in a year. Trees clean the air by filtering pollution – absorbing carbon monoxide, sulfur dioxide and nitrogen dioxide – and acting as enormous carbon sinks. Trees clean the soil by absorbing dangerous chemicals and other pollutants that have entered it. Locking away carbon dioxide in the wood, roots and leaves, they reduce “greenhouse” gases that contribute to global climate change. Trees control noise pollution, muffling urban noise almost as effectively as stone walls. Trees slow storm-water runoff by capturing rain water on leaves and stems and binding the soil, reducing flash flooding and recharging underground aquifers. Trees shade and cool in the summer and break the force of winter winds. They cut costs and energy consumed by heating and cooling buildings. Trees harbor birds and other wildlife, including UofL’s famed white squirrels, making our urban centers a more pleasant place to live. On a more philosophical level, the majesty of trees allows our minds to wander. While rooted in the ground, they reach for the sky. Age, winds and ice have taken a toll on our trees in recent years, but UofL is committed to maintaining the campus as a green oasis in an urban setting. 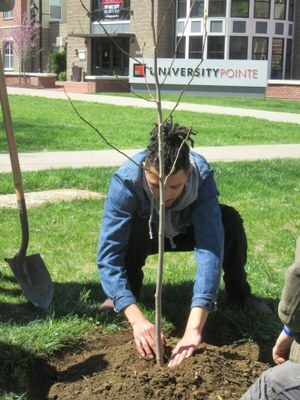 To help financially with UofL’s tree program, visit fundforuofl.org. You also can write a check to UofL Foundation Inc. and note “Restore UofL - Trees" on the memo line. Mail it to: Advancement Services, University of Louisville, 215 Central Ave. Suite 300, Louisville KY 40208-1452. UofL is a Tree Campus USA, having met or exceeded all five of the standards required for designation every year since 2010 and has been recognized by the Arbor Day Foundation for excellence. UofL's Campus Tree Care Plan was finalized December 10, 2010 and revised in 2011, 2012, and 2016. 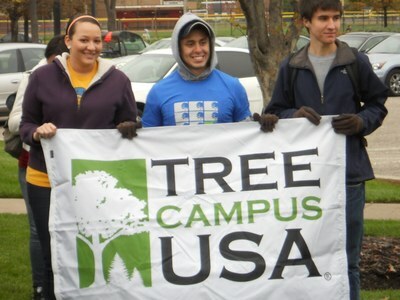 Our Tree Campus USA program is coordinated by the University of Louisville Campus Tree Advisory Committee which formed in February 2010, and holds meetings, events, and service learning activities throughout the year. The mission of the Campus Tree Advisory Committee is to promote, enhance, and protect the urban forest on University of Louisville property. The committee seeks to engage students, faculty, staff and community members in pursuing this mission in line with the University of Louisville’s commitment to climate neutrality and sustainability. If you're interested in getting involved in the Campus Tree Advisory Committee, please contact the Chair, Justin Mog. As a service learning project during the fall 2012 semester, Environmental Biology students surveyed campus trees while Computer Engineering and Computer Science (CECS) students programmed a mobile map-based TREE-App (Tree Research, Education, and Exploration-Application) designed to share information about campus trees with the public. The students accumulated 400 hours of service, surveying over 1,100 trees around Belknap Campus. This information extended our existing database, which was integrated into the TREE-App hosted by the former Urban Wildlife Research Lab at UofL. Data provided: Tree location, age, height, species, diameter at breast height (DBH), live weight, dry weight, native or nonnative, crown width, fruit type, growth factor, number of this species on campus, monetary value, and the amount of carbon dioxide sequestered annually & over the life of the tree. Pests on UofL campus grounds are monitored for threshold levels. Cultural practices are the main defense against pests and are used in most situations to solve problems. Chemical controls are used as a last resort when there is a potential for total crop failure. These products are selected for low use rates per acre and low environmental toxicity. 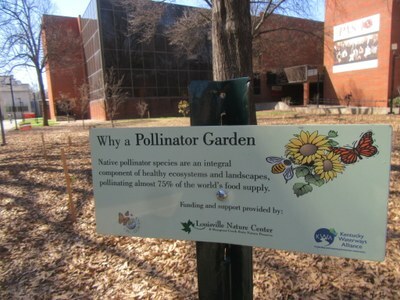 UofL is pro-pollinators! Our practice is to not use chemical insecticides on our grounds, except when absolutely necessary, in very particular, acute, isolated cases. Even then, our practice is to not apply neonicotinoids which have been implicated in pollinator decline. The ONE exception to that is that we are actively treating our ash trees on campus against the emerald ash borer. For mature trees, this involves an injection every other year, which should not pose a risk to pollinators. Biology Department'sHarriet A. Korfhage Native Plant Garden. Planted in 2016 west of the Natural Sciences Building in collaboration with Dr. Carreiro. We continue working with her to expand our pollinator foot print and expanded the garden in 2017 to include a woodland garden between Davidson and Stickler halls. This project was partially funded through the Nature Conservancy, the Kentucky Waterway Alliance, and the generosity of the Korfhage family. Rain garden at the Speed School. Over 5000 sq ft. planted in 2016 with Milk Weed, Swamp Hibiscus, Dan’s Sedge, etc. Butterfly Garden between between Ford Hall and Intentional Studies Building. About 1000 sq ft planted in 2013. Beginning in 2015, each summer, we have planted multiple areas of campus with sunflowers which provide vital, protein-rich forage for bees at a key period in late summer. Sites have included: along the railroad tracks by the SAC & the Speed School, 1710 S. Floyd Street (Hugh’s Lot), 1820 Arthur Street (Grounds Shop/Parking Tow lot), and the Urban & Public Affairs Horticulture Zone. 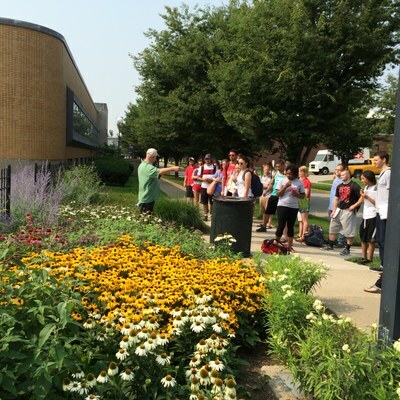 The Phoenix House (Conn Center for Renewable Energy Research): Physical Plant supported the installation of a native plant garden around The Phoenix House in 2016 by supplying compost for containers filled with native pollinating plants, provided by Dropseed Nursery. Physical Plant is currently developing a plan that will expand pollinator-friendly areas around Speed School. We have propagated hundreds of Swamp Milkweed and Swamp Hibiscus plants in our greenhouse for planting on UofL grounds, including sites at the Center for Predictive Medicine (Shelby Campus) in 2016, and at the Urban & Public Affairs Horticulture Zone in 2017. We also planted a native seed mix from Roundstone on the property of the Center for Predictive Medicine (Shelby Campus) in 2016. 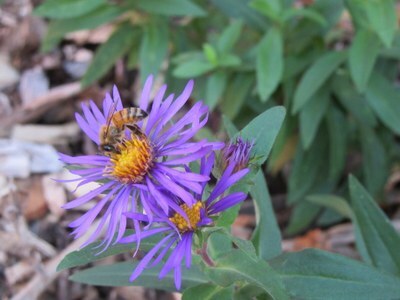 Physical Plant in most if not all new landscapes adds perennial plants that support pollinators. Examples can be seen at the North Information Center, Lutz Hall landscape (south side), Railroad overpass by steps, Humanities Building (south side), and the Ville Grill. In recent years, we have planted over 2000 perennials in these locations. 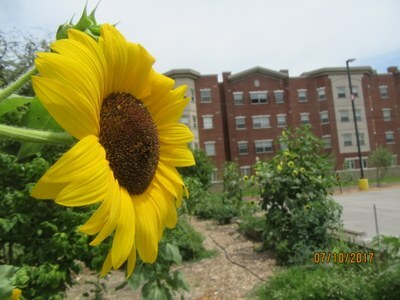 In 2013-14, Physical Plant assisted with the conversion of the two lawn areas behind the Urban Studies Institute (426 W Bloom St) to low-maintenance clover, garden and wildflower areas, during the installation of the Urban & Public Affairs Horticulture Zone, an initiative of the Urban & Public Affairs Student Organization. In addition, UofL owns over 200 acres of wildlife habitat in Oldham County near Brownsboro, known as the Horner Conservation Property and Moore Observatory. 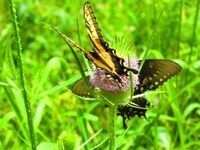 Each year in July, volunteers are invited out to the Horner Wildlife Sanctuary and surrounding lands to participate in a national butterfly count which has been led for years by UofL biology professor emeritus Charles Covell and other butterfly specialists, as part of a national effort to monitor butterfly populations across the country. Prior to spreading out in teams across the landscape, experts teach volunteers how to identify the butterflies they might encounter. In 2015, for instance, volunteers at the site recorded 1,495 individual butterflies and identified 48 species - the second highest diversity ever recorded during the annual census (the highest species count recorded at the site was 50)! 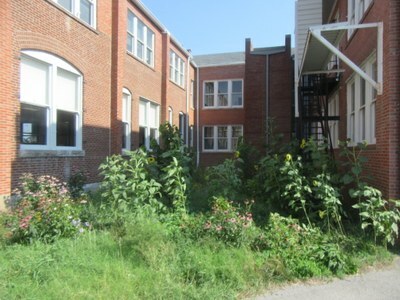 In 2012, students from REACH helped replace fossil-fueled lawn with a butterfly garden near Houchens. 2017: Throughout the spring, UofL's Grounds crew continued to remove unused lawns that represented an unnecessary mowing burden in various corners of campus. 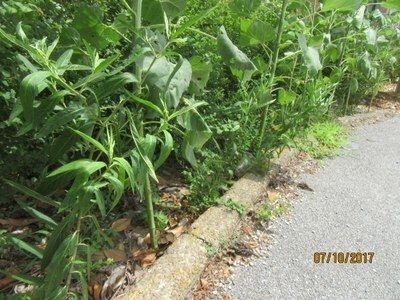 Areas included: Behind Bettie Johnson Hall in the verge along the brick alley where a dozen native serviceberries have been planted; the west side of the Urban Studies Institute, where a native persimmon tree has been planted; and the area along the south side of the Eastern Pkwy overpass, where grass has been replaced by a hemp trial run by the Conn Center for Renewable Energy Research. 2016-17: Harriet A. Korfhage Native Plant Garden: Beginning in April 2016, the Biology Department collaborated with the Grounds crew and Dropseed Nursery to remove an unused lawn area west of the Life Sciences building and replace it with a native plant living lab. The garden serves a number of our Biology labs by providing on-campus access to native plants as well as the insects such plants attract. 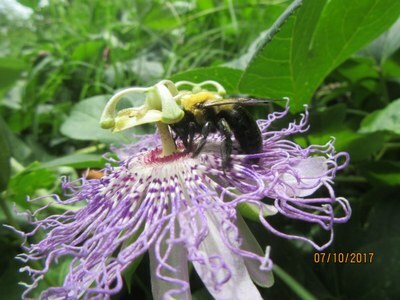 A number of our courses benefit from having such an area including Entomology, Plant Taxonomy, Medicinal Plant Biochemistry, Ecology, and perhaps Animal Behavior. The garden also engages donors and participation from the Beechmont Garden Club as well as Botanica. · Eliminated need for mowing. 2014: The Grounds crew worked with student volunteers from GRASS to replace marginal lawns with lower-maintenance flowers and native plants on the south and east sides of Jouett Hall, and at the northeast corner of Davidson Hall. 2013-14: The two lawn areas behind the Urban Studies Institute (426 W Bloom St) were converted to low-maintenance clover, and garden areas during the installation of the Urban & Public Affairs Horticulture Zone, an initiative of the Urban & Public Affairs Student Organization, with funding provided by both the Student Organization and the Department of Urban & Public Affairs. 2012-13: The Grounds crew worked with student volunteers from REACH and GRASS to replace lawn with a lower-maintenance butterfly garden at the north end of Brook Street on campus (between Houchens and the Office of Health Promotion). This garden provided many years of beauty and pollinator habitat, but unfortunately, it was removed in 2017 to accommodate the expansion of the Student Activities Center. 2009: The first trials involved replacing turf with micro-clover plots which don't require frequent mowing and fix nitrogen to maintain soil fertility. The first trial was on the southwest corner of the Miller Information Technology Center. When selecting landscaping plants for certain sites on campus, we're not only thinking about what would look nice, but what other benefits could be provided. One thing that makes landscaping even more attractive and sustainable is when it's designed as a feast for your stomach as well as your eyes! 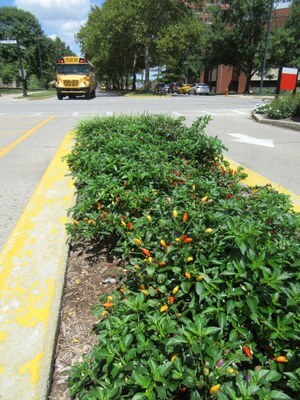 In addition to our designated food gardens, UofL's campus also features some edible plantings tucked into various spots, such as the beautiful and fiery Bolivian Rainbow Hot Peppers and decorative cabbages that we plant in flower beds. The grounds around the Urban Studies Institute have also been planted with native pawpaw and persimmon trees, maypops (native passion fruit), and apples, figs, peaches, and herbs. 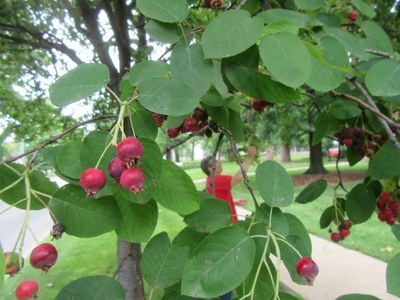 Another important foraging crop on campus are the many native Serviceberry trees which produce a delicious blueberry-like fruit with a nutty flavor (it's in the almond family!) in late May and early June. They are commonly planted for their beauty, low-maintenance, and short stature which makes for easy berry-picking and easy growing under power lines. Look for them to be ripe on campus around Memorial Day weekend. Especially good foraging locations are the east side of Third Street from Ekstrom Library to just south of Eastern Pkwy and the railroad underpass; the Duthie Center for Engineering; and along the brick alley behind Bettie Johnson Hall. Be sure to sample some of these tasty treats as you stroll through our campus, but please wash them first! Though we minimize chemical use, just like most of the food in the grocery store, this produce is not managed organically and may also have dirt, dust, and bacteria on it. Ice melting products are selected based on environmental conditions. The weather is monitored closely and preventative applications are used only when snow and ice accumulation is imminent. Equipment is calibrated to apply the proper amount of product to facilitate ice/snow removal. In May 2014, the Grounds crew began a new trial using locally-produced biodiesel to power their diesel machinery and trucks. The biodiesel is made from waste cooking oil, some of which is supplied by UofL Dining, and is sourced from Kelley Green Biofuel of Goshen, KY (5100 Greenhaven Lane), a community-scale, ASTM-certified, National Biodiesel Board registered biodiesel producer with an annual capacity of 75,000 gallons, located just 30 miles from campus. The first trials are using a B20 blend of 20% biodiesel and 80% petroleum diesel. In another effort to use less fuel and further reduce our carbon footprint, UofL's fleet of lawnmowers was converted to run on cleaner-burning propane rather than gasoline. Mowers powered with propane burn up to 30 percent less fuel, generate less pollution, carbon emissions, and noise, and are safer and easier to maintain than mowers powered with gasoline. In 2011, Physical Plant switched over its entire mower fleet for Belknap campus—eight push mowers, five riding mowers and two walk-behind mowers—to run on propane in refillable tanks. This conversion has helped reduce minor fuel spills and is saving UofL about $2000/year in fuel costs. It will pay for itself in just four years without outside incentives. As our gasoline powered lawn trimmers reach the end of their lives, Physical Plant will also be replacing them with cleaner, more efficient propane or electric models. Learn more. The U.S. Environmental Protection Agency estimates that garden equipment engines produce up to 10% of the nation’s air pollution. Studies show that a conventional lawn mower pollutes as much in an hour as 40 late model cars. The Biology Department collaborated with the Grounds crew and Dropseed Nursery to remove an unused lawn area west of the Life Sciences building and replace it with a native plant living lab called the Harriet A. Korfhage Native Plant Garden. The Sigma Pi fraternity worked with the Grounds crew to install UofL’s first rain garden in the Speed School parking lot. The project involved replacing 5126 square feet of grass at the southwest corner of the intramural fields in the Speed School parking lot with 4 Swamp White Oaks and a mixture of native plants supplied by Dropseed Nursery which will facilitate infiltration. UofL seeks to minimize irrigation and water waste through a mix of high-tech and low-tech means. The first strategy is to plant primarily natives (or hardy non-natives) which do well in our local climate with minimal irrigation. We use soil probes and rain sensors to determine if irrigation is necessary. In 2009, a "Rainbird SMT" smart controller was installed at Thrust Theatre to control irrigation based on soil type, plant type, topography, and historical evaportranspiration & weather data for Louisville. A pilot study is underway to determine feasibility for Evapotranspiration Based irrigation control. Some new buildings, such as our LEED Gold certified Student Recreation Center and the Clinical & Translational Research Building have been designed to capture condensate and/or storm water for use in irrigation. Central Irrigation Control is being considered for Belknap campus. This control system would allow us to irrigate based on real-time soil moisture, weather & evapotranspiration data, and would use flow sensing to monitor for leaking pipes and broken sprinkler heads. Currently we monitor the environmental conditions and manually adjust our 18 automatic irrigation controllers on Belknap campus based on weather data. Central Irrigation Control can save up to 30% of water for irrigation purposes. Proper watering, based on real-time data, is also healthier for plants and can help them fight off disease and insects naturally. The Horner Bird and Wildlife Sanctuary is a 210 acre reserve owned by the University of Louisville in Oldham County, just across I-71 from Crestwood, Kentucky. This wildlife habitat, located just 30 minutes from Belknap Campus, is also the site of the Moore Observatory operated by UofL's Department of Physics and Astronomy. Get an aerial view of UofL's own wildlife refuge! The wildlife refuge is located in the Interior Plateau Ecoregion. The site is a former farm that was abandoned in the mid-20th Century (more history of the site here) and has since been allowed to regenerate as eastern deciduous forest. Two permanent streams and two ponds occur on the property, and maples, oaks and hickories dominate the secondary growth forest. Horner is principally used for student research and serves as a reference site for scientific comparison with more urban woodlands and parks. The best-known public education project at the refuge is the annual Horner Butterfly Count conducted by UofL biology professor emeritus Charles Covell and other butterfly specialists. 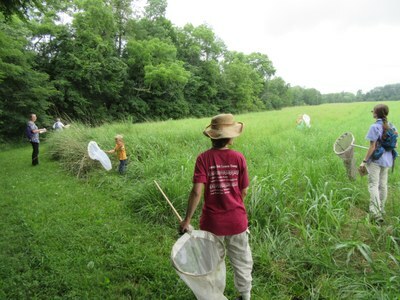 Each year since 1976, roughly 50 volunteers, including schoolchildren and senior citizens, spend a day in July at the Horner Wildlife Sanctuary and surrounding lands participating in a national butterfly count. The citizen science census is part of a national effort to monitor butterfly populations across the country, building a long-term picture of changes in butterfly diversity. Prior to spreading out in teams across the landscape, experts teach volunteers how to identify the butterflies they might encounter. Count leaders supply nets and field guides, while volunteers use cameras, binoculars and notebooks to gather information. In 2015, for instance, volunteers recorded 1,495 individual butterflies and identified 48 species - the second highest diversity ever recorded during the annual census (the highest species count recorded at the site was 50). The results are reported to the North American Butterfly Association, which monitors the changes in butterfly populations throughout the continent. The Horner Bird and Wildlife Sanctuary is part of the Kentucky Organization of Field Stations (KOFS), a network that supports and promotes understanding of natural systems through education, research, and outreach in Kentucky. The UofL Grounds Maintenance Department utilizes selected green waste created from the care of the lawns, landscape and trees on Belknap campus to create compost/mulch on site at the Hughes Lot on E. Bloom St. between Floyd & Brook. This includes chipped/shredded tree limbs, shrub trimmings and leaves. These materials are "tub ground" once or twice per year for mixing and particle size reduction. They are then piled based on their age and turned regularly for aeration. No artificial irrigation is used for the operation. 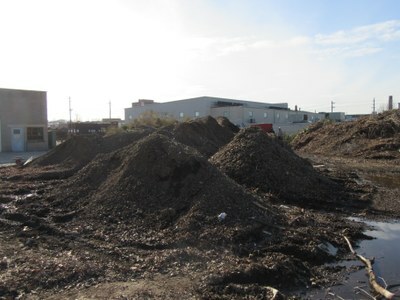 After the materials have decomposed to a satisfactory state, they are used as mulch in campus landscaping or given to the university community. UofL is also composting animal bedding and food wastes, and you can help us out! Full details about UofL Composting here.